There is no doubt that we had a great time fishing, hiking, sightseeing and relaxing in Yellowstone and Gardiner, MT. All of that was made even better by being able to visit with some great friends. We all met for dinner one last time at our favorite place - The Raven. The ribeye steaks are the best you will ever eat and the baked beans are amazing. We will certainly miss this wonderful campsite where we "lived" for five weeks. The view always held something different for us to notice. We feel truly blessed to have had such a wonderful experience out west and hope to be back there many times. Today Dave and I fished Soda Butte Creek. We had a great time. The canyon had willing fish and the water was clear and cold. We found that various caddis patterns and a black and blue nymph that Dave had worked very well. Tomorrow (Saturday) we will be packing up and then heading home on Sunday. It's been great to see all our friends here in Montana and to fish and spend time with them. 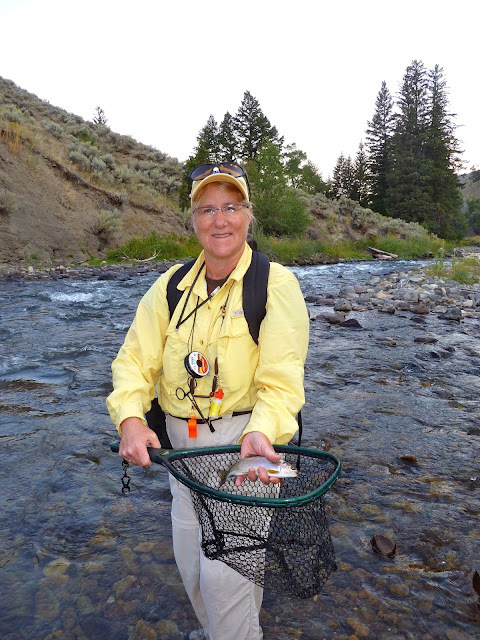 The Yellowstone area has much to offer and Michelle and I enjoyed it all --- "On the Fly". I had to tap her on the shoulder and stop her and show her this. It's known, among "Antler Round-Up" competitors as a "pure double". Both sides of this bull's antlers found laying there together... I couldn't believe she didn't see them. This was a perfect chance to get off the schnide with a double no less... and so it goes! Final Score: Doug = 16 Michelle = nil - she never got off the Schnide - Again! Today we had our last visit to Gardner's Hole all planned. 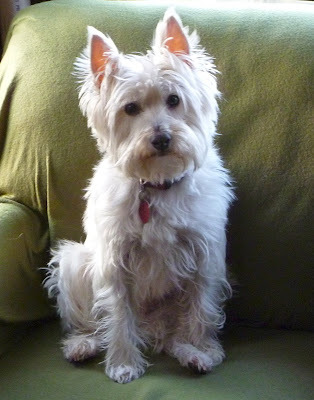 Stella tried to convince us that she should come along but we had to leave this white bear-bait behind today. As we drove into the park we couldn't help but take a look at the morning moon by the arch and Electric Peak. It looked like a great day to visit one of our favorite places. After an early fishing trip we had the rest of the day free and decided to take a trip out to Lamar Valley. It is a beautiful place in the park and we were hoping to see some more eagles out there. The wonderful thing about Yellowstone is that you are guaranteed to see some wildlife, you just never know what kind. Below High Bridge - a quick fishing trip. Well we tried to "beat the heat", 91 today, by fishing early in the day. It's been in the 90's for the last week or more and I think it's starting to get to us. We hooked up with a few fish today nymphing rather than fishing the dry-dropper rig. Michelle caught her first Rainbow of the trip a real jumper. Oh and I --- lost a "good fish" when he got the line tangled around a rock cutting the line --- bummer. We quit about 10:30 and headed to breakfast and "beat the heat". Tomorrow it's going to be about 85 so we are looking for a little relief. The guys in the shop are reporting the fishing is slow in the afternoon due to the high temp's and low water. We got us a fire! We have been hearing the reports of the many fires that are burning in Montana, Wyoming, and Idaho. Yesterday we saw this in the sky just behind our campground. At first it looked like just a beautiful, white, fluffy cloud but then it was obvious that it was much more. The smoke cloud was awesome to watch as it grew and changed before our eyes. We watched the smoke show for a while and then headed out for a nice dinner with friends. As we drove north from Gardiner we realized that the fire was not "just over the hill" from our campground as it had appeared. It was actually 10-15 miles away which is as close as I hope this fire gets to us and others. The Bechler River - a technical challenge! Antler Round-Up - the current score! Quick fishing trip today - BBQ later!